I guess I could sit and lament on all I did each week while pregnant with Parker...and how much I did and didn't do while pregnant with Grace....and how much less I'm even doing with this one....but I'll just focus on the fact that I'm doing an update now. Ha! 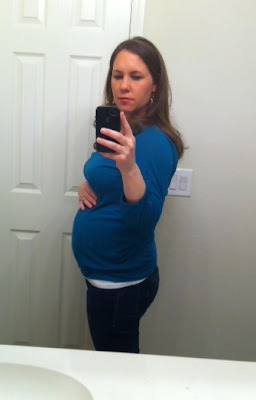 So here I am....almost 25 weeks pregnant (on this coming Sunday). Here's a little recap since my last update at 18/19 weeks. And I just found this next picture that I took just 2 weeks earlier....my how I have grown in such a short time!!! -On December 15th- Geoff was able to feel the baby move for the first time. I was 20 weeks and I do feel like this is the earliest I've felt a baby move from the outside. It was kind of funny- I had just gotten home from work. Was exhausted and sitting on the couch. Geoff asked me (which he had a few times at this point) if he could feel the baby moving now. I told him, again, that no- he could not...it was still way too early. Well...I guess baby boy heard....and he started moving around. I thought, "Wait a minute....I think I can feel him on the outside, too." And sure enough, I did. And luckily- he kept moving and Geoff was able to feel him move! It really never gets old. The girls have tried to feel a few times...but earlier on, his movements weren't as big as they are now and so I think it was hard for them to really feel him. Now I can see him moving all around from the outside. Crazy! - About 2 weeks ago (at 23 weeks)...I started noticing that my heart was skipping beats. It doesn't hurt...but just kind of uncomfortable and makes me feel like doing nothing...just kind of worn out. Come to find out- they're called PVC's (premature ventricular contractions) and while they are not 'normal'....the are 'common' in pregnancies when your blood volume is increased and just that extra work load and your heart just starts pumping a little less efficiently. There's nothing to do about it and me and baby are ok. I just try to take it easy more often and listen to my body a little more. The night that these started....I had just mentioned to Geoff earlier in the night that I felt like I had worked harder and been on my feet more in the past few days at home than when I am working. I had been blowing and going...cleaning and organizing and throwing out....that I just didn't rest much. I also read that sometimes it can be lowers levels of potassium so I added a banana a day (almost) into my diet (which could all be in my head!). Too much caffeine can also be the culprit!! And while I do have my 1 cup of coffee a day and sometimes (about 2-3 times in the week) I'll have a Dr. Pepper later in the day....I did not feel like I was overdoing my caffeine intake. My doctor said that 10 cups of coffee will cause PVCs...not the amounts I was taking in. But still- while having these I backed off the caffeine a little more. Anyway- happy to report that after about 5 days of very frequent PVCs...they have since dissipated and I only have them a few times in the day. And they don't bother me as much as they did before because they are much less frequent and the episodes do not last as long either. -I don't know if you'd call it nesting....but I'm definitely in the mood to get things cleaned and organized! It's really just a compilation of things that I've been wanting to do since we've moved in...like curtains in the dining room....things for the walls. And while I still don't have it all figured out....I have an idea of some things that I want to get done and would like to get them done before baby comes. I have lists and lists....and I seem to be adding to my lists more quickly than I can mark the stuff off! -Baby Boy has a birth-day scheduled. It's April 29th. I'll be 39 weeks and unless he tries to come before then- this will be the day! -I finally figured out the nursery colors I want to use....and I actually just ordered the fabric for his curtains and bedding yesterday and today. Eeek. Not sure what I'm getting myself into, I guess....but I am really really excited about trying to sew it all myself. I could have someone make me what I want but I think it'd be close to $550-600 for all of it....the bumper, crib skirt, and curtains. Not worth it. I'm keeping up with all that I spend on fabric and such so I can compare at the end how much I saved. Although- my sanity might be worth something....so whatever of that I might lose by then I might have to count as loss, as well. Haha! And I realize this whole decorating-the-nursery is all for me and I could probably spend my time elsewhere, but I'm having so much fun....and with this being, more than likely, (Geoff says it is) my last baby- I just want to do it all. -I had a doctor's appointment yesterday and his heartbeat was around 140 (good). He's measuring about 26 weeks...so about a week and a half ahead. Which is also fine....both girls always measured 2 weeks ahead....and they were both over 8 pounds so I don't expect any less for this guy. I go back in 3 weeks and will have the fun glucose test and will be in my 3rd trimester. Still can't believe it. The first trimester kind of drug on (even though it went fast, too) because I didn't feel well....and now with feeling mostly well and somewhat energized.... and with the busy-ness of the holidays....it's just going more quickly. Slow down time! This one is going fast...here it is January and he'll be here by the end of April. My oh my! As usual, time flies by. BTW, I sent Grace a card & sure hope it gets there by tomorrow. CANNOT believe she is turning 3 already! Love you all! Congrats on a little boy. April 29 is my Levi's birthday and I had him at 39 wks.